Purple was requested for tonight! I had a little trouble initially with the colour. Up until now I have done fine with mixing 3 food colours - red blue and yellow (Dr Oetkers and Supercook brands). All baths have only taken a few drops of colour for a lot of effect. I tried to mix together the red and blue tonight though and very quickly had a very black bath! Not the effect I was going for! I remembered then that I had bought some lilac colouring for Eden's 2nd Messy party so I grabbed that. It was brand Silver Spoon and I'm not sure if it was the brand or colour that is difficult but it took most of the bottle to achieve the effect! It did work though and that is the main thing. My other problem was that we really didn't have any purple toys! A couple of blocks but really not a lot. 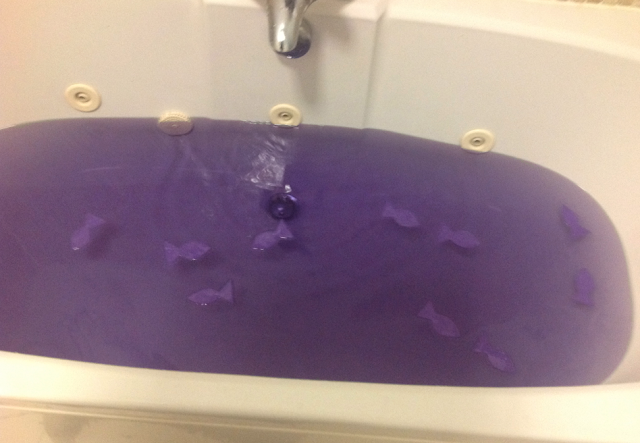 I could have used some balloons, but what has been so much fun this week though has been the challenge of making each coloured bath different; so I found a sheet of purple foam I cut into fishes! With some bubbles from a party bag (happily in a purple pot) it completed the effect! Joplin swam the fish (they eat bubbles for dinner don't you know!) and Eden tried to catch the bubbles! Then Eden wanted to have a go at blowing bubbles - the pot lasted about 2 dips before it was submersed but he had fun trying! Then Joplin wanted to count the fish. I love how they take learning to a different level just through play! Pink tomorrow. Joplin did request brown but I am slightly nervous of that one!! At least I know how to make black now though if needed!! Your comments make my day! Do let me know what you think! Thanks Mum! I'm going through the food colouring like mad though!! My blog in a magazine! Rainbow Bath Week Day 9: Rainbow balloons! Rainbow Bath Week Day 7: Pink!